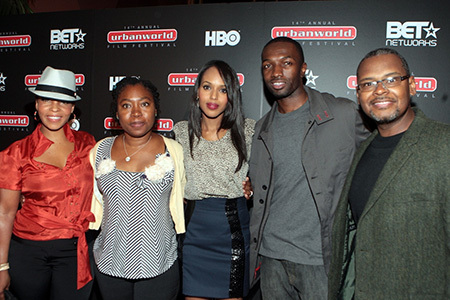 The 14th Annual Urbanworld Film Festival kicked off on Thursday with the movie Night Catches Us, starring Kerry Washington, Anthony Mackie, and Jamie Hector. The stirring drama, set in 1976, deals with a young man who returns to a race-torn Philadelphia neighborhood where he came of age as a member of the Black Panther Movement. The characters try to negotiate their past, present, and futures amidst complex political and emotional forces. For more than a decade Urbanworld has been a venue for minority filmmakers who needed an outlet to showcase their work in an industry where few urban films receive distribution. Sponsored by HBO and BET this year, the festival plans to show more than 70 films. Aside from Night Catches Us, the other standout films this year were: MOOZ-lum, a drama directed by Tanya Hamilton, starring Nia Long and Evan Ross, about a young man pulled between his strict Muslim upbringing and traditional teen social life he yearned to experience; and I Will Follow, a drama featuring Salli Richardson-Whitfield and Omari Hardwick that deals with issues of grief and family. On opening night, we caught up with the director and cast of Night Catches Us and asked them to explain why film festivals like Urban World are important. Watch the video below to find out what they had to say. UrbanWorld’s founder, Stacy Spikes, also talked with BlackEnterprise.com about his inspiration for the festival, challenges for directors in the industry, and tips for up-and-comers. BlackEnterprise.com: What inspired you to start the Urbanworld Film Festival? Stacy Spikes: I was the vice president of marketing at Miramax at the time, and people were sending me films that weren’t in other festivals, and I thought these films needed to be seen. They weren’t showing anyplace else, and I thought we should have our own festival. Why are film festivals like Urbanworld important? We create an opportunity for exposure. 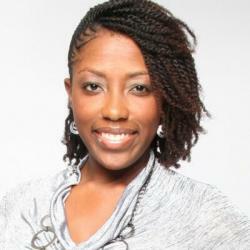 We hold up the best of black films and that showcase gives them an opportunity to go on elsewhere to do great things. That is our purpose. Why is it difficult for African American films to get widespread distribution? It is difficult for all films to get distribution. You figure, the Sundance Film Festival gets 4,000 submissions and maybe 10%-15% will get distribution. That’s 1/10 of 1%. Our festival is not any different. One or two of these films might see distribution. Television is opening up a lot of doors with BET and HBO. They are often putting them there. But as far as theatrical it still is a really rough game. In the last couple of years, what filmmaker has taken the most innovative approach to marketing and distributing their films. Qasim Basir, the director of Mooz-lum in this festival had 70,000 Facebook fans. They sold out their screening in minutes. We had to have two additional screenings in the festival. That has never happened, ever, in the history of the festival. Their resourcefulness and resilience-I’ve never seen anything like it. What tips would you give to African American filmmakers about managing the business of filmmaking? We can rely on our community, because we go to the movies more than anybody else. You don’t need a distribution system. If you think like that it will help you to get where you’re trying to go. The industry needs us. We’re going to need a rebirth of the early ’90s and late ’80s that you saw in black films with House Party and all of those films. That is what we want to bring back; that resilience. [Back then] we just made films, we just got them made [raising money] from investors, family, bake sales. There are so many ways filmmakers hobble money together to get it done. All of those avenues they’ve got to pursue. Visit BlackEnterprise.com later this week for one-on-one interviews with Jamie Hector, actor from The Wire and Heroes) and Ava DuVernay, director of I Will Follow.